The Jazz/Rock Fusion Page:a site is dedicated to Jazz Fusion and related genres with a special emphasis on Jazz/Rock fusion. If case you haven't heard, guitarist Dean Brown is a 30 year veteran of the fusion scene. He has recorded and performed with many of the fusion world's greatest players including Billy Cobham, George Duke, Joe Zawinul, Lenny White ..the list goes on and on. 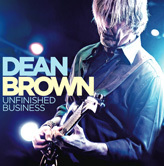 Dean's latest CD, "Unfinished Business", is his fourth release as a leader. It is an eclectic mix of fusion, rock, funk, blues, and Latin that features an all star lineup including, among others, Marvin "Smitty" Smith, Dennis Chambers, Hadrien Feraud, Jimmy Earl and Gerry Etkins. The first tune on the CD, "Uncle Ray", starts off in high gear with Martin "Smitty" Smith's drums leading the way into a blues-rock inspired groove that features Brown's soulful acoustic and electric guitar playing . "Just Do It" is a funky jam that showcases Brown's searing blues-rock chops. The mood changes with "Two Numbers", a tune that starts out light and jazzy, then changes into Afro-Cuban 6/8 funkiness and climaxes with a killer drum solo by Marvin "Smitty" Smith. The gears change again with "Recon", a high energy Santana-esqe Latin number. Brown's soloing takes center stage on "Headless Horseman", a tune that alternates between jazzy/light and intense/searing. Other notable tunes include the funky "Hail to the King" and the Wes Montgomery inspired "Whole Tone Blues." Brown is an impressive player who navigates seamlessly between styles and has the enviable ability to balance lightless with intensity. All of the tunes are well written and have interesting arrangements that keep things moving and allow Brown and the other players to interact. "Unfinished Business" is an excellent release from someone who was there at the beginning and who is still helping to keep the fusion flame burning. For more information please visit: www.deanbrown.com. 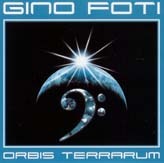 2006 has been a good year for Gino Foti. The prolific bassist/pianist has released four CDs this year: Orbis Terrarum, Sphere Of Influence, Bhavachakra, and Vedic Mantras. As the CD titles would seem to imply, Foti’s draws much of his inspiration from world music. Middle Eastern influences figure prominently in an eclectic mix of styles that also includes touches of jazz/rock fusion, flamenco, funk, and rock. The two CDs I received for review, Orbis Terrarum and Sphere Of Influence, feature Foti on bass and piano. 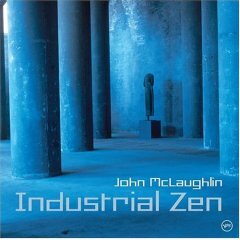 He makes extensive use of samples and loops throughout both CDs. 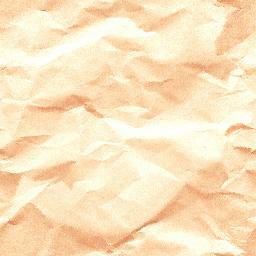 Foti also produced, arranged, engineered, mixed and mastered the CDs. For the most part, he does a good job of using samples idiomatically to make the parts sound like real players, though I felt he relied a bit too much on a particular fretless bass sample. Two guest musicians, Dave Kulju on guitar and Chris Rossi on piano, make brief appearances. The first piece on Sphere of Influence, “Infinite Realms of Light & Dark”, sets the mood for the rest of the CD. Using samples of hammered and plucked Chinese instruments together with electric bass and percussion, Foti creates an oriental musical tapestry. 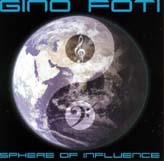 If you like music from different cultures and times, let Gino Foti’s CD take you on an aural world tour. For more information click here. If you would like to be considered for a review here, please send one mp3 file or link to: reviews at wandlar dot com.